While 2016 was a disappointing season overall for the Lions, with just three wins and a spate of injuries, some young cubs showed plenty of promise in their development, while some older Lions stood up to be counted. Today lions.com.au brings you the next part of the player review series. This time, for players with guernsey numbers 16-20. After working his way into the Lions side against Carlton in Round 11, Jansen proved to be a handy pick up for the Club. Despite playing unaffected by injury this season, at times he struggled for consistency, often falling out of sight of the selection panel; he played 7 games for the Lions in 2016 and travelled frequently as the team’s emergency. Jarrad Jansen, in his first season after coming across from Geelong, made his AFL debut and played 7 games. His main attribute is contested ball, he had an average of 9 contested balls per game. Clearance wise he averaged 3 clearances a game and 4 tackles per game. He played mainly as an inside mid and occasionally went and played forward. He was able to impact the scoreboard by kicking 4 goals in 7 games. Jansen will be better for the year at the Club and another preseason, we will hopefully see him play more game time through the midfield in 2017. Claye Beams’ season came to an abrupt end against Southport in July after re-injuring his knee in the NEAFL. The 25-year-old suffered a torn medial meniscus. It was the third serious knee injury for Beams, who underwent a full reconstruction in 2013 after a training mishap. Fully recovered, Beams will be hoping to pick up from where he left off in 2017. 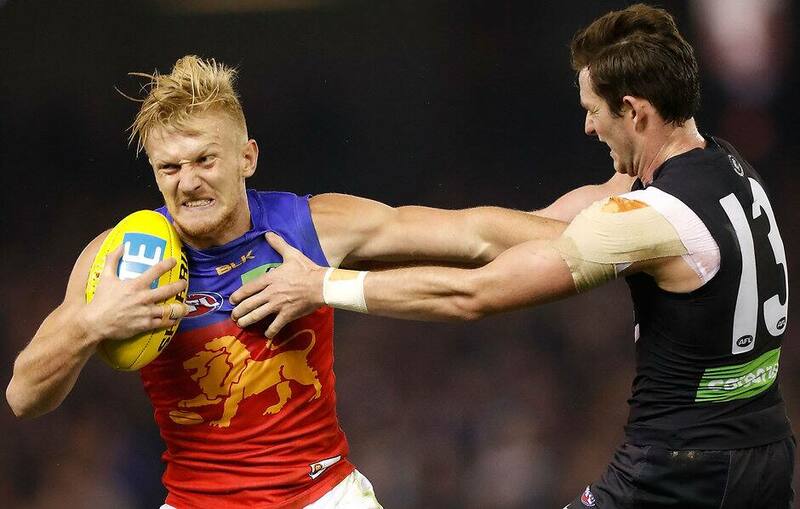 Claye Beams only played 9 games for the season, again he succumbed to injury. He had another knee operation and spent a few games in our 2nd’s. He was used mainly across half back for his ability to use his run and drive and kicking efficiency. His efficiency was 80% which is one of the highest at the Club. Claye had 17 rebound 50s, he is another one who is in rehab at the minute and hopefully can be ready for the start of preseason and cement his spot as a half back or a wingman moving forward in 2017. Nick Robertson started his third season at the club well, winning the Club's first time trial of the pre-season. While he played six AFL games, the majority of his season was spent in the NEAFL and when he returned to the senior team in the back half of the year, he suffered a season ending knee injury. Nick Robertson is another one who was dogged by injuries this year. He only played 6 AFL games and in that time, played mainly as a wingman. He floated across half back but moving forward we see him as probably a winger or half back who can use his run and carry and his pace which he is exceptional at. Josh Clayton began his second year of development for the Lions by playing for the Reserves in the NEAFL. The 20-year-old earned a senior call-up in Round 22. A hard runner (his GPS results were a consistent strength),Clayton’s ability to run and carry is an asset to his game. Josh Clayton played mainly across half forward and had stints across half back in the NEAFL. He managed to earn his senior debut in round 22 and played two AFL games, mainly as a half forward. It was a great experience for him to play two games at AFL level and hopefully set him up for bigger and better things for season 2017. The second-year playmaker battled groin issues in 2016, only managing 6 NEAFL matches. He returned in Round 8 in the Reserves but was again sidelined by the same injury in Round 17. Josh Watts again was hampered by injury this year with groin and hip problems which didn’t see him play much footy at all at NEAFL level. He was delisted at season’s end.